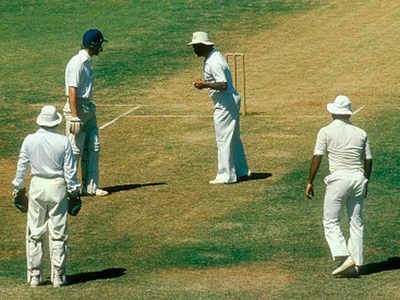 In 1980, on their way back home from Australia, England played one-off Test with India in Mumbai. This was to celebrate the 50-year completion of Board of Control for Cricket in India. This was also the first time when Ian Botham was visiting the subcontinent.The start of the match had some adorable scenes. 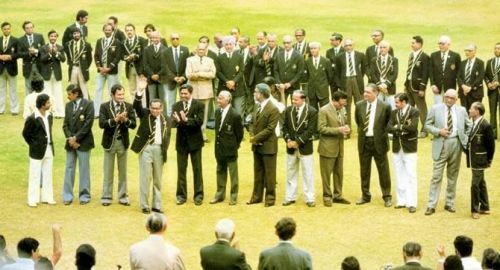 BCCI did wonderfully well to invite all the Indian test cricketers for previous 50 years for this match and all of them were in the ground with Indian blazers on. This was quite a historic scene. Sunil Gavaskar, who met most of his childhood heroes on that day, was seen to be running like an excited child to get the autographs from these stalwarts. One of them was Syed Mushtaq Ali, the man who scored the first overseas century for India at Old Trafford in 1936. He was known for his aggressive batting style. The Indian domestic T20 tournament is named after him. Gavaskar sensed the occasion and, as if to celebrate Mushtaq’s presence in the stands, hit John Lever for a huge six in the very first over of the match. That was quite a start, after Indian captain, Gundappa Vishwanath, won the toss and decided to bat. England made some strange choices in their line-up. Even though the wicket had a fair amount of grass cover (very unusual for a Mumbai wicket), they were suspicious that the ball would start turning at some point of time. So, they added two spinners in their line-up – Derek Underwood and John Emburey. Eventually, the match was so much dominated by pace that Underwood would send down only 7 overs in the match and Emburey did not get a single over. India got a brisk and excellent start. Although they lost Roger Binny, the opening partner of Gavaskar, from a mix-up, Sunny played with unusual freedom. Dilip Vengsarkar supported him nicely to bring 100 for India in quick time. At 102 for 1, and with Gavaskar on 49, disaster did strike for India. 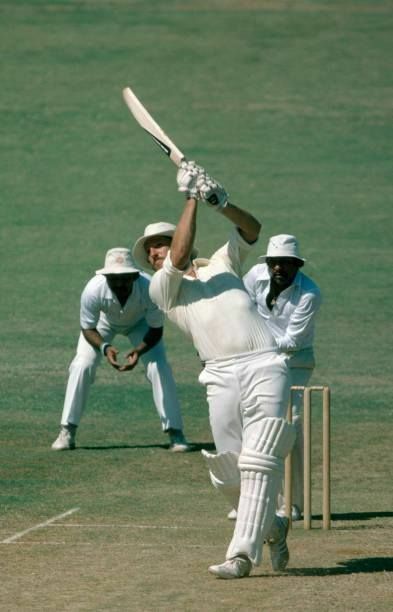 Botham bowled an outswinger, which was edged by Sunny and Bob Taylor grabbed it in front of the first slip. It was one of his ten catches in the match, a then world record. The rest of the day belonged to Botham. In a wonderful spell of pace and swing, he took 6 for 58. India slumped to 242 all out, after being 100 odd for 1. Taylor took 7 catches. England’s response was far from ideal. They were all at sea against the pace of Kapil Dev and Ghavri. Soon, the scoreboard was reading 58 for 5, when Taylor joined Botham. They took the score to 82 when Kapil Dev won a caught behind appeal against Taylor. Taylor was not happy with the decision and was indicating that he did not touch the ball. Vishy, who was standing in the slip, was also not sure. He checked with Taylor and then took an unprecedented step. He went to umpire Hanumant Rao and told him that he did not think that there was an edge involved and he would like to withdraw the appeal. Taylor came back and resumed his innings. This proved to the turning point of the match, as this pair would further 147 runs to take the match away from India. Taylor would bat for almost 5 hours for 43, and Botham would play a great knock of 114. England would eventually be all out for 296, with a vital lead of 54. The decision from Vishy cost him and his team dearly, and probably eventually resulted in the loss of Indian captaincy. However, he never regretted it, “I would have done the same – every time”. He lost the game but won many hearts. Botham was not finished yet. In the second Innings, he would bowl 26 overs unchanged and took 7 for 48. In fact, India were reduced to 58 for 6 at one stage and were only able to get some score due to a fine 45 from Kapil Dev. India were all out for 149, leaving England to chase 96 for victory. Graham Gooch and Geoff Boycott knocked off the runs without much fuss or loss of wickets. Botham was the shining star of the match. He became the first in the Test match history to score a century and take 10 wickets in the same match. Only Imran Khan and Shakib Al Hasan would be able to match this record later. His Test record till then looked awesome – more than 1000 runs at an average of 40+ and 139 wickets at an average of 18.5. “India Bothamed” was the apt cover story of a renowned sports weekly. Once England were back home, a hunt for the new England captain began, as Mike Brearley declared that he would no longer lead the team. All the selectors favoured 24-year-old Botham to be the successor of Brearley, except one. Brian Close decided to have a heart-to-heart talk with Botham. He mentioned that he would not vote against him but clearly felt that Botham was not ready for the job. He felt that Botham would still need 4 to 5 years of captaincy experience at a different level before becoming competent to play the role. “Turn it down, Beefy,” he said. Botham really was not ready for captaincy. Terms such as “motivation” or “man management” were foreign to him. He could not understand why people would need motivation to play for his own country. He thought over it, but could not decide on refusing England’s captaincy. It was just not possible. He said yes to Alec Bedser, the chairman of the selectors, to become the youngest England captain since Ivo Bligh in 1882-83. It was not a very good omen as it was the defeat of Bligh's side which had prompted those famous Melbourne ladies to burn the bails and present the ashes to him in an urn. Botham’s fateful decision would change the course of his career and create the background of one of the greatest Ashes stories of all time.